I’ve just been in the Netherlands for a few days, taking in a few of the fantastic Roman collections there. I was around part of the Limes area, although the standing remains of forts, fortifications and towns have all but disappeared or been built on by later generations. The museums, however, are filled with large and varied collections of both military and civilian artefacts. 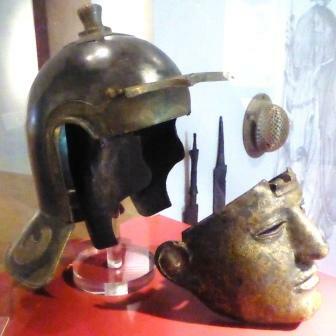 One type of military artifact that the main museums have in common is the Roman cavalry parade helmet, with face-mask. These are also called ‘sports helmets’. 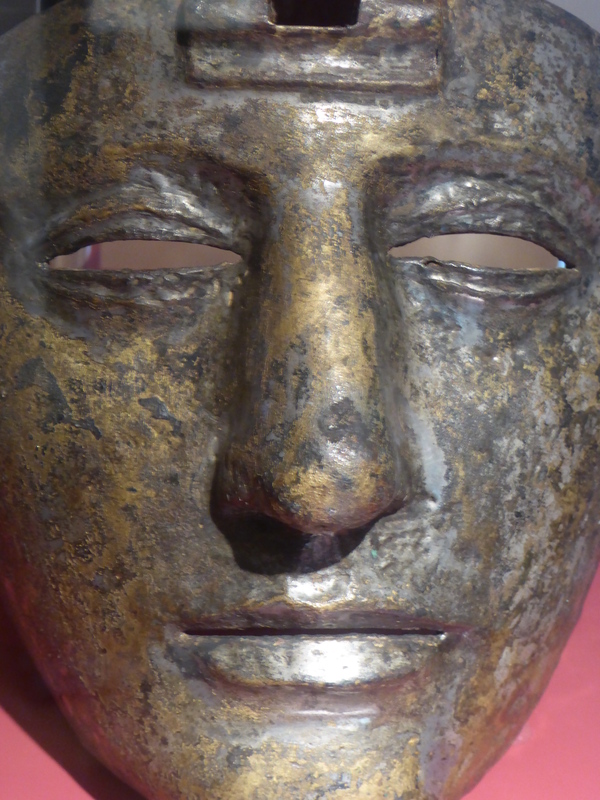 The masks are quite startling to see and have a very ‘Man in the Iron Mask’ feeling, but these were status objects. These cavalry helmets were probably worn by the commanding officers and the best horsemen of cavalry units and were worn primarily during parades and tournaments, not in combat situations. The face-mask element of the helmet, hindered the rider’s vision meaning that he could only see a restricted area straight ahead and had none of the normal peripheral vision. This renders the helmets, complete with the face mask in any case, unsuitable for combat situations where unrestricted vision was vital for success and survival. On some of the face-masks, the mechanism for fixing it to the rest of the helmet is evident. There is a hinge placed centrally in the forehead. The face-mask part of the helmet would therefore open upwards. While some of the face-masks have plain sides, others have ears! 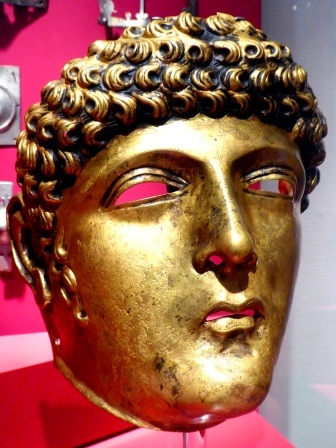 The helmets and masks seem to be made, primarily, from iron, but as these are display objects, they would originally have been silvered, copper- or bronze-coated, to glitter and gleam in the sunlight. These two examples retain some of this coating. 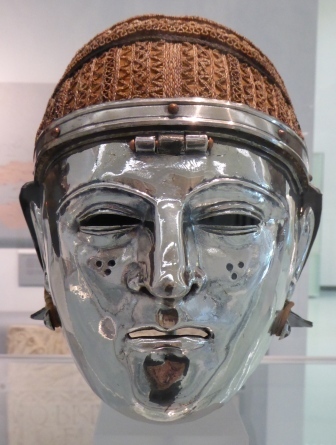 At the Museum het Valkhof, Nijmegen, there are two examples of close-fitting face-mask helmets with a woven skull-cap. Traces of the fabric element have survived, corroded onto the metal. And alongside the one on the left, a reconstruction of how the helmet may have looked when new. And this particular example is shown with both the face-mask and cheek-pieces. 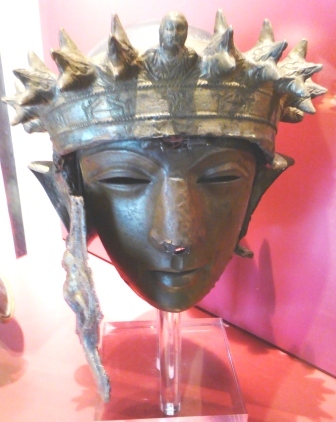 This particularly ornate helmet was the only one I saw with both the face-mask and cheek-pieces actually fitted together. It looks a bit unwieldy, with the cheek-pieces covering the face-mask, which seems to defeat some of the display objectives. I can help wondering whether it was designed to give the wearer a choice; face-mask or cheek-pieces, rather than both together. Here is another cheek-piece from a different helmet featuring, appropriately enough, the god Mars. 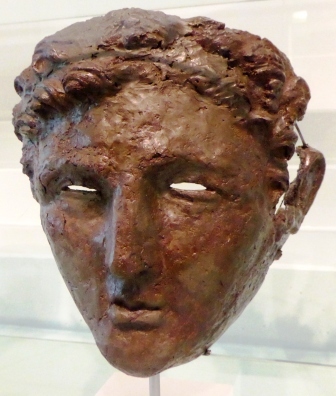 Some of the helmets, masks and other objects (notably the gold-coloured face-mask earlier in this post) have been found embedded in the mud at the bottom of the many canals that criss-cross the Netherlands. Some of the best preserved examples have been preserved by the wet, oxygen-free conditions. 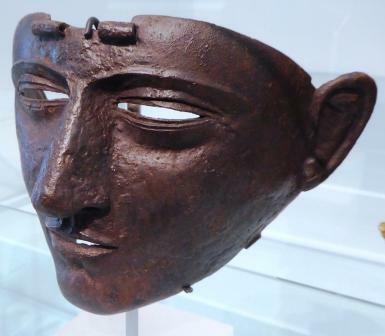 As there is extensive evidence for the importance of watery places for ritual activity, it is very possible that these helmets and masks were deliberately deposited, perhaps as offerings giving thanks for successful campaigns or periods of service. I leave you with a few more examples of military headgear from Amsterdam and Nijmegen. 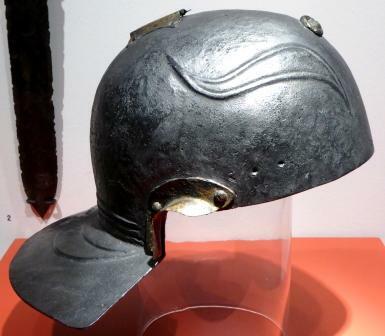 For more musings on Roman cavalry helmets, have a look at the excellent blogs of Following Hadrian and Per Lineam Valli. 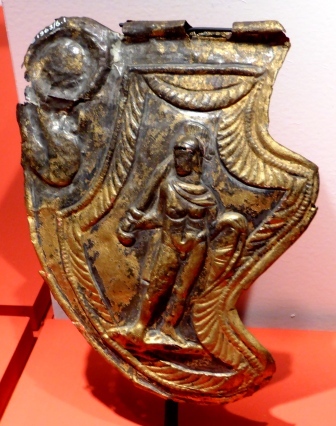 This entry was posted in Archaeology, Museums and Exhibitions, Netherlands, Romans, Uncategorized and tagged Amsterdam, Archaeology, Leiden, Museum Blogger, Netherlands, Nijmegen, Roman. Bookmark the permalink. Would u mind if I used the first picture for the cover of a FanFiction I’m writing? If I don’t hear back in a week I’m going to take it as you don’t care and I can use it anyways. Thanks and have a great thanksgiving. Hello, actually I’d prefer it if you did not use my images for fan fiction. BTW, I’m actually away and have only intermittent access to this blog so if I hadn’t been able to respond by your deadline it would have been because of that, not because I don’t care about my stuff (it’s probably better not to make that assumption). A happy thanksgiving to you. I’m from the UK, so thanksgiving isn’t a thing there.